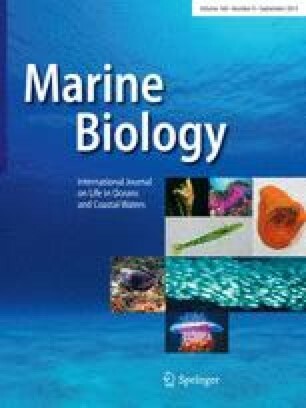 Allozyme electrophoresis was used to characterize genetic variation within and among natural populations of the red sea urchin Strongylocentrotus franciscanus. In 1995 to 1996, adult urchins were sampled from twelve geographically separated populations, seven from northern California and five from southern California (including Santa Rosa Island). Significant population heterogeneity in allelic frequencies was observed at five of six polymorphic loci. No geographic pattern of differentiation was evident; neighboring populations were often more genetically differentiated than distant populations. Northern and southern populations were not consistently distinguishable at any of the six loci. In order to assess within-population genetic variation and patterns of recruitment, large samples were collected from several northern California populations in 1996 and 1997, and were divided into three size classes, roughly representing large adults (>60 mm), medium-sized individuals (31 to 60 mm, “subadults”) and individuals <2 yr of age (≤30 mm test diam, referred to as “recruits”). Comparisons of allelic counts revealed significant spatial and temporal differentiation among size-stratified population samples. Recruit samples differed significantly from adult samples collected at the same locale, and showed extensive between-year variation. Genetic differentiation among recruit samples was much higher in 1997 than in 1996. Between-year differences within populations were always greater for recruits than for adults. Potential explanations for the differentiation of recruit samples include pre- and post-settlement natural selection and high interfamily variance in reproductive success or “sweepstakes” recruitment. Unless recruit differentiation can be attributed to an improbable combination of strong and spatially diverse selection, such differentiation across northern California populations indicates that the larval pool is not well mixed geographically (even on spatial scales <20 km), despite long planktonic larval duration.